When making the switch from point and shoot cameras to DSLRs, one aspect of the DSLR that can be confusing is some of the additional options you have for shooting extreme close-up photos. One of the great things about using a DSLR camera to shoot close-up photos is that you have a lot of options for adjusting the aperture and other settings to create a high-quality close-up photograph. The DSLR camera also has a few different accessories you can pick from that are designed specifically for close-up or macro photographs, which can help you have even more success. Use these tips to learn more about shooting macro, micro, and close-up photos with your DSLR camera and for learning about your options for accessories. When looking for lenses for your DSLR camera, seeing "micro" or "macro" in the name of the lenses both refer to the same type of lens. Both will perform the kind of photography you want, in other words, making a small subject look big. Macro is the more common term, though, used to refer to DSLR equipment designed for close-up photography. For a photo to truly be called a macro photo, it must be shot with a DSLR macro lens, which must have the capability of shooting at least a 1-to-1 ratio magnification. You can think of macro lenses as shooting extreme close-ups. If you don't want to purchase a macro lens for your DSLR camera, you still can shoot close-up photos by simply moving closer to the subject, filling the frame with the subject. Almost any type of interchangeable DSLR lens will work for a close-up photo. While a DSLR camera may have a macro setting that can be used, most of the time this actually is close-up photography. When using the DSLR camera's macro setting, you're simply causing the camera to adjust its autofocus mechanism to work with subjects that are very close to the lens. The macro setting doesn't change the way the lens itself works. An interchangeable lens that is a true macro or microlens is required for actual macro photography. So why would a photographer care if he or she is shooting macro or close-up photos? With an actual macro lens, you can capture far greater details in your photos than you can with simple close-up photography. You also can achieve much greater magnification using a macro lens with your DSLR camera. However macro lenses can be expensive, so unless you plan to shoot a lot of macro photos, it can be difficult to justify the additional cost. When selecting a macro lens for a DSLR camera, you’ll want to make sure you pick a lens that can achieve the type of magnification you want. Additionally, make sure it can sharply focus on the subject without causing the overall scale of the photo to be distorted. You may need to test these types of lenses before you buy them to ensure you’re receiving the quality and features you want. Another advantage of most macro DSLR lenses is that they are fast lenses that can shoot at a wide open aperture (with a small f-stop number). This ability allows you to use a very shallow depth of field, which blurs the foreground and background and produces the sharp focus on the subject, drawing attention to the subject. 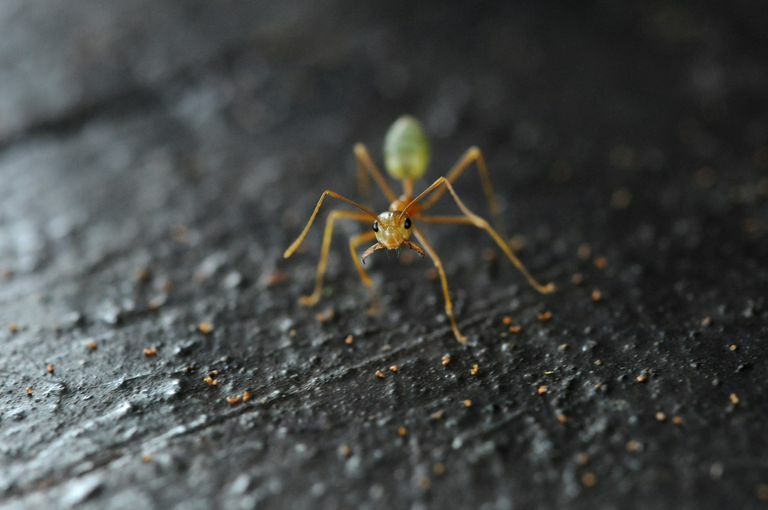 With a very shallow depth of field in your macro or close-up photo, you can even end up with a photo as what's shown above, where the ant's body is in focus, but its forelegs and back legs are out of focus. When shooting true macro or close-up photographs, you may find that you want to use manual focus to ensure the sharpest focus possible. You can rely on the DSLR camera's autofocus mechanism to attempt to provide a sharp focus, but some autofocus mechanisms can struggle with extreme close-up photos. By using manual focus you also can pick the precise point on which you want to focus, which is extremely important when shooting with a very shallow depth of field, again as shown in the photo above.